DDL Mechanical Propeller Driven R/C Model Aircraft Windsock LQQK !!! Here you have a DDL Prop Driven Wind Direction Wind Sock !! This wind gauge features an all metal frame & nose tube. Tail is made of corrugated plastic material that is fully waterproof and will not rust. Plastic 13 Inch Model Airplane Propeller !! The base is made to fit on the top of a chain link fence (line post, the vertical one in the ground). It has been finished with two coats of primer and two coats of Rustoleum Paint For Great Weather Resistance !! It is 36 inches long and 9 inches high at the rear of the tail frame & it weighs about 2-3 lbs. 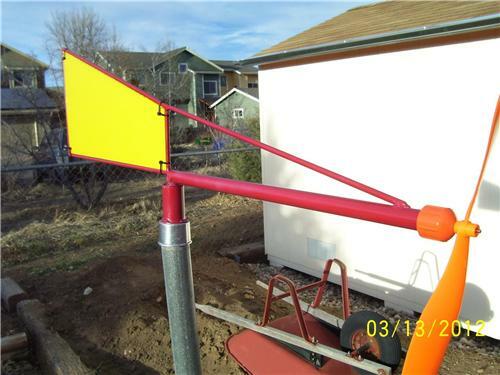 These units are custom built by Dave Livinghouse in the town of Ft. Collins Colorado and are priced to sell so pick one up while you can for yourself at home, as a gift for that special friend or relative or for use at the local flying field !! You can't go wrong here when you have a "BUY IT NOW " price of only $45.00 and shipping is available !! If you have any questions or concerns please feel free to phone: 970-227-5436 or 970-224-5349 or e-mail at: ddlivinghouse@q.com for more details and answers !! OK, so Thank You For Looking, and Please check my other "BUY IT NOW OFFERS" for Heli's, Planes, Cars, Trucks, Boats, Parts, Upgrades Accessories And Many More GREAT DEALS ! !